What a painful loss that was, but the whole game had a feeling of "what can go wrong, will go wrong," at least the defense put up their best performance of the year. 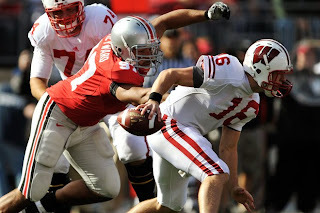 Even so, Terrelle Pryor does not look like a good quarterback yet, and Ohio State's offense is absolutely anemic. Rough game for the Junior Scott Tolzien. Yes, he was under a lot of pressure, but those two interceptions he threw were essentially game breakers (along with horrendous kick coverage). You can make a case that Tolzien being hit caused the first interception, but if he was throwing to the underneath receiver than he deserved to have the ball picked off, because that route was not open. More likely (and Dustin and I agree on this) he was throwing to the end zone where he had Isaac Anderson in man coverage and, seemingly, open. The hit just took all the zip out of the throw and made for an easy pick. Still, there were some inaccurate throws and 27 of 45 isn't quite as efficient as a quarterback needs to be. After some of the early hits he also got a bit skittish in the pocket, he'll have to be better next week against another good defensive front in Iowa. Zach Brown started, get over that please. Brown has been ineffective and is now hurt, so maybe that will finally break this idea that he's a good running back. John Clay showed some good power but never really got into a rhythm. Also, I don't buy into the thought that Brown is better at blitz pickup then Clay. Clay did a good job in that role once Brown was out of the game. Montee Ball showed some good burst as a spell back, more than Brown has shown all year. Depending on how severe Brown's concussion is, expect to see him a bit more next week. Terrible day for this group. Let's start with the Tight Ends, who really had no positive impact on this game. Lance Kendricks and Garrett Graham combined to catch just five passes for 43 yards. Graham also got flagged for three penalties, two of which were very costly holding penalties. On to the wide receivers, who were also terrible. Most notably, the dropped touchdown pass by Isaac Anderson. After that play the wind fell completely out of the Badger's sails. Dropped passes have been a problem all year long, and it finally caught up with Wisconsin in Columbus. On a side note, it was good to see Kyle Jefferson getting some balls thrown his way. With Anderson's drops don't be shocked if Jefferson gets a chance to make some plays in the next few weeks. In a game where Scott Tolzien was sacked six times you would probably expect this grade to be worse, so stay with me here. In the first, say, quarter-and-a-half, pressure was a problem. But, the line started to settle and Offensive Coordinator Paul Chryst adjusted his play calling for quicker routes and holding a running back in to block (something Mike McCarthy could take a lesson from). After that the O-Line started to really handle the pass rush. Up until late in the game when the Buckeyes didn't have to play the run, they gave Tolzien time to make plays. This was a good test for this group and with this battle under there belt they should be better prepared for the caliber of defensive line they face from Iowa next week. How good is O'Brien Schofield? He is a one man pass rush, and an impact player against the run. Any play made near or behind the line of scrimmage is probably made by him. Schofield had two more sacks and had 3.5 tackles for loss. He's a special player and fun to watch. J.J. Watt also had another good game, the defensive line really seems to be rounding into form. After Watt and Schofield, the Badgers are putting together a nice rotation with Louis Nzegwu, Patrick Butrym, Dan Moore and Jeffrey Stehle. You can't say enough good things about Mike Taylor. To be having an impact like his as true freshman speaks volumes about his talent. Along with Schofield and Safety Chris Maragos, Taylor is a star on the Defense. The rest of the group had another steady performance as well, containing the "dual" threat quarterback, Terrelle Pryor. Culmer St. Jean notched an interception and Blake Sorensen and Jaevery McFadden have been as steady as ever. It was a simple task this week, Terrelle Pryor is not a good throwing quarterback. So good coverage on the 3-4 accurate passes he will have in a game is not too much to ask. Antonio Fenelus' coverage on DeVier Posey's touchdown catch was just terrible. The sad part was, Fenelus had good coverage, but he never looked for the ball. If he does, he's probably able to make a play and the Badgers go into half time with a lead. Where is Jay Valai? The hard hitting safety has yet to make any impact on the 2009 season. It's not a complete fail because the Badgers only touchdown came as a result of a fake field goal. Even that's not enough to salvage the abysmal kick coverage that Wisconsin had in the second half. They say on a kickoff return the returner has to make at least one man miss to bring it back. Well, not on Ray Small's 96-yard return. The lane that he had on that return was big enough for an obese person on a rascal to score through. Unacceptable. The Badger's have one of the worst kick coverage units in the country. One observation that was made after the game is that the Badgers offense needs to make a quick transition from offense to defense when a turnover is made. And that's true. Interceptions and fumbles happen, and when it does the Offense can't allow long returns. Two pick-6's is just hard to believe, and that's exactly what happened. That said, despite the 18-point loss, this game gives us a much better idea of where Wisconsin stands. The Badgers didn't look over-matched, and had they not shot themselves in the foot so many times they would have had a very good chance to win the game. Next week against undefeated Iowa at home, the Badgers are good enough to win. And they do not have a game on the schedule for the rest of the year that they can't win. Second place in the Big Ten is in reach, and maybe even a share of the title, as long as they don't continue to give their opponents points.